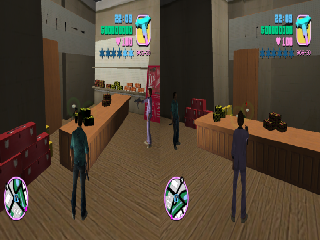 Just decided to show my beta version of mod for gta vice city that allow to play with second player in one PC using 2 mouses and 2 keyboards. To start play 2 players press F12 (without cutscene) That mod still have many bugs with 1) hiding the game, 2) 2nd player sometimes removing durring missions, 3) submissions dont work for unknown reasons. But i´m more interested how you got 2 Mouses working at the same time on one PC. Are you using an external Tool or Script for this or is this only working in this specific Game itself? Horizontal split screen mod ? GamePad support for Second player ? And some stuff that i may remember to put later?